'Throttle Kit EVO', the new throttle kit developed for racing vehicles. We listened to the requests from race support teams to improve throttle operability and maintainability and designed a new framework. A high-spec model which has had all frictional resistance eliminated when operating the throttle. Developed with a different concept to the throttle kits up to now which have progressed based on street custom motorcycles, it is a product of extremely high quality recommended also for street use. * The Throttle Kit EVO large body product line-up is Φ48 - Φ54.For installing Φ36 - Φ46 on large body throttle kits, purchase the individual Φ36 - Φ46 bracket separately. Vertical separation throttle housing gives you more easy detachment of throttle housing, throttle cable and throttle reel. 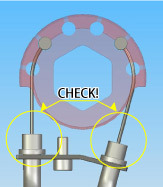 Throttle housing can be separated by loosening two bolts. Throttle cable is slided and removed. 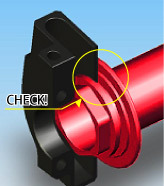 Throttle cable stopper can be removed by loosening one bolt. Now throttle housing is fully separated. 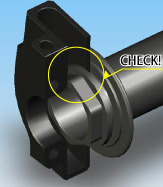 Throttle reel is detachable and easy to exchange. By reviewing all the components of our current Type-1, 2 and 3 throttle kits, we reduced the friction drag at maximum, as well as pursuing workability, maintenance and oberability. 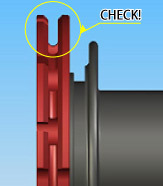 The bottom of the cable groove on the cable bracket has the round shape to fit the cable and reduce the friction drag between the cable and the reel. 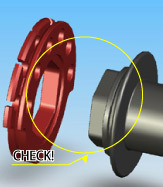 The cable drum holes on the throttle reel has only one side, to reduce the slip of the cable drum and ensure more firm fitting. 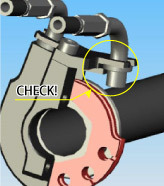 By having the groove on the throttle pipe, the throttle pipe is firmly fixed on the throttle housing and never touches the inside of the throttle housing. 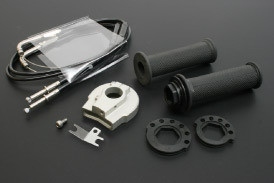 Insertion type throttle cable gives you more flexibility in the throttle cable mounting position and direction. Also, it makes much easier to fix on/remove from the throttle housing, and as a result, throttle cable length adjustment becomes easier. 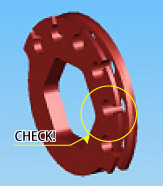 Throttle reel is detachable and easy to exchange. Also, it doesn't need to remove the rubber grip when exchanging the throttle reel. 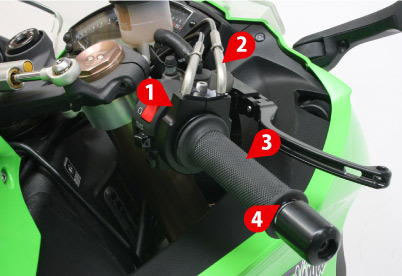 The canopy on the throttle pipe prevents the throttle pipe from too much inserting into the throttle housing. The throttle housing is designed to move the throttle cables in more natural way and less friction, by placing the throttle cables in slightly angled. The inner cable is made in stainless steel (SUS304) to prevent from rust, and treated with swaging and smooth finishing to reduce the friction drag. Although the workability and maintenance was dramatically improved, the total length of the throttle assembly is almost the same as Type-2 throttle kit by having 115mm gripping area. Wider range of throttle reel gives you more choice of throttle twisting.